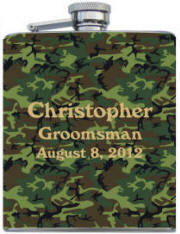 A collection of camo themed gifts for your dynasty! Duck Dynasty is a reality television series showing the lives of the Robertson family, whose family business, Duck Commander, makes products for duck hunters. Known for their long beards, Phil, Si and Willie are a colorful collection of characters. Phil vehemently dislikes technology and doesn't want his grandkids to become "yuppies". Si is a storyteller, a Vietnam War veteran and is famous for his blue plastic tupperware cup of iced tea. Willie is the brains of the operations with a business degree that took the family business to a multi-million dollar empire. Dark green corduroy fabric is the background for this safari adventure backpack. 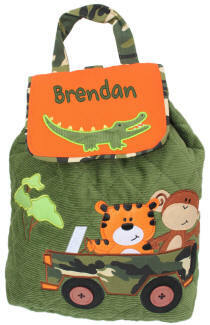 Quilted backpack has a camo jeep applique, a tiger and monkey, and a crocodile design on the flap.